Whether you’re an electrician, performing light construction work, or hiking the mountainous trails, Timberland PRO Men’s Hyperion Waterproof Work Boots might be a nice choice for you. They are also on our list of the top work boots available, and we are going to tell you why. 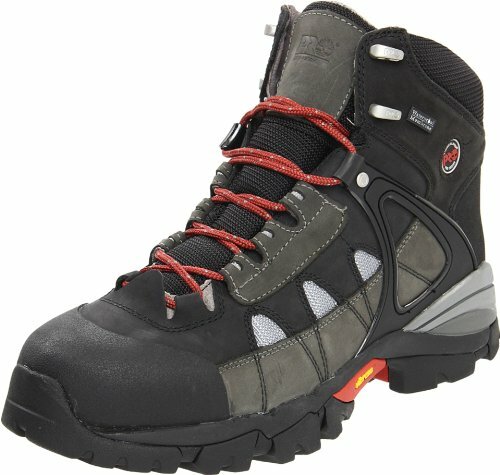 First off, we only mention brands and boots that have already earned a valued reputation, and then we dig deeper to provide you additional information on particular styles and brands to assist you in making the right choice, plus we rate them in areas of safety, comfort, and price. Waterproof leather accompanied with a waterproof membrane is designed to keep your feet comfortable and dry through any wet weather conditions. < img> Though these work boots may look like typical hiking boots, they offer so much more as far as durability. Cement construction along with the Ever-guard leather with abrasion resistant technology, the molded rubber sole, and the double layer rubber toe guard are all features that are combined in these work boots to assist in long-lasting durability. However, we would not suggest them for heavy construction, or jobs that require additional safety features. As a work boot that resembles more of a tennis shoe or hiking boot than an average work boot, they also fit like them as well. They are featured with a lightweight, molded EVA midsole that provides athletic performance and anti-fatigue technology that absorbs shock and returns energy back to the foot for improved stamina. They also come with a padded collar for cushioning around the ankle. Timberland also offers a 30-day comfort guarantee, which means, after 30 days and the boots are not as comfortable as you had hoped; simply return them for a refund. These are not a safety toe work boot; however, they do have an additional layer of rubber on the toe area that provides adequate protection against abrasions or stubbing. A Vibram outsole provides adequate traction on various terrains and the double rubber toe cap and backstay is abrasion resistant. Furthermore, the waterproof leather and membrane keep your feet dry. The protections offered in these boots are designed for those working in semi hard labor environments, not for hazardous jobs that require additional safety features. Along with being a nice choice work boot for hikers, they are also ideal for road construction, concrete work, and carpentry. They are well suited for outdoors as well because of the waterproofing and the ample traction that the outsole produces. These work boots do not come equipped with a safety toe and are not ASTM rated. However, they would make a nice addition for someone who requires the flexibility and movement that these boots provide. Also, these boots tend to work well for those with Plantar Fasciitis or flat feet, as they have a nice size heel and provide support in the arch area. They tend to run a bit large, so we suggest wearing thicker socks or a half size smaller than your average shoe size. However, larger stores such as Amazon have an excellent return policy if you are having an issue with the size. There have been some issues with rubbing around the ankle area, especially if you have narrow feet. We would suggest choosing a sock that will cushion that area properly. They do tend to cause some sweating in hot weather, however, check out how to keep your feet from sweating in work boots! The Timberland Pro Hyperian Waterproof Work Boot resembles more along the lines of a hiking boot than a work boot. They style is designed for comfort, flexibility, and easy movement. They are a lace up boot with dual-purpose top hardware for lacing customization. In addition, they can be utilized on the job or for everyday use.